I know it bothers some Christians that some of their fellow followers of Christ don’t believe in evolution. They’re embarrassed. They hear the new atheists in the media dogmatically insisting that if you’re a Christian who doesn’t believe in evolution you are delusional, or imbecilic, or loathsome. Richard Dawkins and other new atheists encourage people to ridicule and mock those who disagree with their views. (Hamilton, Dawkins: Mock Them. Ridicule Them. In Public. With Contempt.) Unfortunately that approach has trickled down to too many people. The result is some Christians hear disparaging comments from friends or coworkers who have been influenced by Dawkins and other new atheists–and they feel intimidated. After the Bill Nye-Ken Ham debate a thirty-something asked me some questions about evolution. He said he wondered if I might have better answers than Ken Ham from my “many years of research.” That made me laugh, because most of my life I’ve studied fire science professionally, and the Bible only as a lay person. I haven’t studied the issue of evolution or creation much. My favorite scientist who has studied these issues is a guy named Jack Akin. He’s a bio-chemist who works as an environmental engineer and he seems pretty down to earth from what I know of him. He once helped Kathy and I move a friend of Kathy’s (on short notice) which says something about his humility I think. If you’re interested you can check out his website here: AkinfortheTruth.net. All that being said, as long as we’re in this series on doubt, and since the Nye-Ham debate is on people’s minds, I do have a few thoughts about the issue of doubt and evolution. Some people like to present evolution and the Bible as a conflict so they can sell books. And the media is happy to help. They’re happy to help because the writers in the media need a story, every day, and that’s more difficult than most people appreciate. And to make a story work they have to have a conflict. (There’s an old adage in journalism: No conflict, no story.) And while I appreciate the position journalists are in, their propensity to emphasize conflict can create a false impression. This is the case when it comes to “evolution vs. the Bible,” or the idea that you can either believe in evolution or you can believe in the Bible, but you can’t believe in both. I encourage you to do your own research. The incompatibility of science and the Bible, and even evolution specifically, is just not there. The truth is, concerning evolution, there are a range of views available to the Christ follower. So you don’t have to feel rattled the next time you hear a disparaging comment about a Bible believer who doesn’t embrace evolution. That social pressure isn’t a good reason to doubt anyway. Can I give you my best advice? Don’t let any of it become a distraction to what’s central to the Christian faith: the person of Jesus Christ. All communication is this way. If I say to my wife in the frozen food section of the grocery store, “You’re so hot, you better leave or you could melt everything in the frozen food aisle,” (Yeah, I know, but that’s as poetic as I get.) I don’t mean to be taken literally. But if the store is on fire and I say to my wife, “We better leave, because it’s going to get really hot, and smokey,” of course I want her to take me literally. 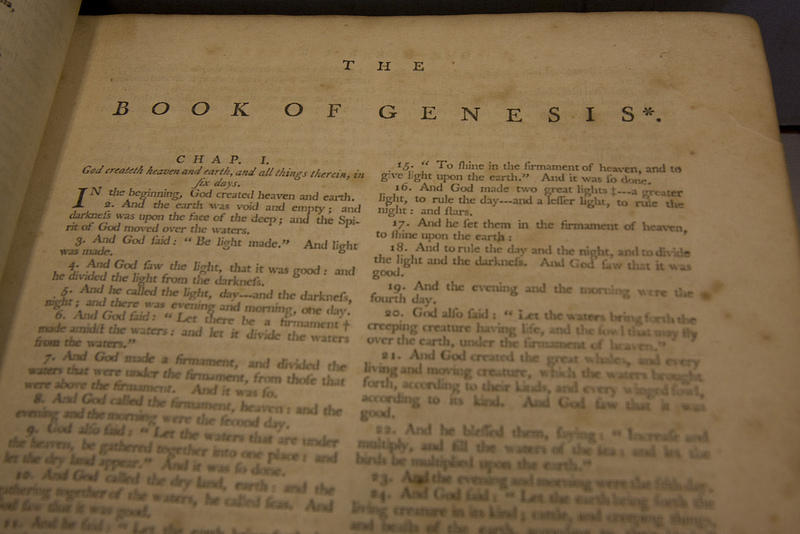 Obviously there will always be disagreement about how to read certain parts of the Bible, Genesis chapter one included, but it doesn’t make sense to say you have to interpret every part of the Bible literally to ascribe complete authority and even inerrancy to the Bible. Judges chapter 5 being a clear example. For those who read Genesis chapter one poetically, they recognize the text as having not addressed the process by which life was created. So the evolutionary biological process is a viable interpretation of the Genesis account. This entry was posted in Bible Commentary, Bible Study, Genesis, Seeker and tagged bill nye, Bill Nye Ken Ham Evolution Doubt, Christian evolutionist, Christianity, creationism, Evolution, Jack Akin, ken ham, modern creation science, richard dawkins by Kurt Bennett. Bookmark the permalink. I agree for the most part. I used to adopt this mentality towards things like the dinosaurs (without doubt finding proof in the Bible and so forth, not just citing ‘the leviathan’ story), at what stage the tribulation comes (pre, mid or post) and so forth as ‘not necessary’ to know for salvation. And I still hold that true. But I stopped short in telling myself it didn’t matter or ‘wasn’t important’. Because if it (the subject or event) is in the Bible, it most certainly is important. I hold the belief that my Lord is powerful enough so that whatever He wanted to include in the main text of what most people call the Bible today, He’d have made sure through his power to have had it included. I hold that thought because of the extra books that were added by the Catholic church (don’t get me started) after the fact from the original canon. So, believing that God intended what we have in the Bible to be of importance, I no longer wipe away my not fully understanding of a subject by simply stating, ‘its not important for salvation’. That in a way is discounting or putting off the importance of having had it included by God. He most definitely wants me to read it all and take what the Holy Spirit intends for me to take away from it. For me, do I believe in the 7-day creation in literal terms? Yes. I believe my Lord is powerful enough to do what our minds cannot possible comprehend can be done, at the entire world having been formed and done in that short amount of time. What throws me off sometimes is the statement in the Bible, ‘to the Lord, one day is like a thousand years’ (paraphrased). I find it hard to believe however that it took the Lord 1,000 years to make man from dust on that particular day. That would be jumping from poetic to historical narrative. So, do I find it then hard to imagine the Lord sprouting up areas of the earth through violent eruptions, and creating sinkholes and plains at the same time elsewhere along with vast seas and lakes and so forth? In one day’s time? He flooded the entire earth full up in 40 days. We can at least believe in that correct? He didn’t do it just by rainfall but by opening up the earth below as well. That was done suddenly with Noah having just enough time to load up the last of all that he was commanded to load up and then seal the door shut. Since a complete understanding of how long it actually took the Lord to create what he noted in Genesis is truly irrelevant to accepting and making Jesus our Lord and being saved, I don’t sorrow or get worked up about it. But I also don’t want to marginalize what was put into the Bible by the Spirit of the Lord either. It was put there for a reason. The whole Nye/Ham thing I chalked off as another exercise by the brainy to win a debate over another person. It was pointless as I’m thinking that most that watch a debate like that are just there to further polarize themselves. It isn’t like an atheist was won over or a brother in Christ lost because there platform was stronger over the other’s. May God continue to bless you Kurt! Keep up the great work of the Lord!